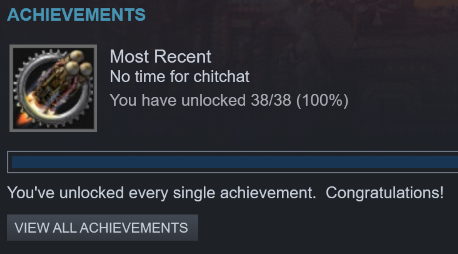 So in case someone is still interested in getting this Achievement feel free to copy this way. And please tell me how it turned out! edit: the extra 3 boilers and solar panels are not included in the BP since I just built them because I had some power peaks after I used a bucnh of productivity modules on the oil processing chain. You don't really need them. Nice! If you're willing to spend a little more time on it, I'd recommend doing a full write-up in your own post. If you do, I'll cross-link to it from my current (old) guides. It's generally taken me a couple of hours to do a writeup, but you probably don't need to go into that fine of detail. Take a higher-res screenshot. You'll have to play around with the zoom parameter of the /screenshot console command to find something that works. Factorio can do pretty big screenshots, although to get truly huge ones you have to take multiple in tiles and stitch them together, which is more pain than it's worth. Include a separate screenshot for the stone area, since it's way off to the side. Make sure to get a good (zoomed-in) screenshot showing how to align the master blueprint with the world when you start out. The forums will host images in posts, take advantage of that. In my experience, it's more reliable than imgur. Where'd you do your initial jump-start with burner drills? Did that get overwritten with the rest of your base? You've got a lot of long belts - did you have issues with belt-hogging/inserter timing? If so, mention that (and which belts) in your writeup. This is such good information. 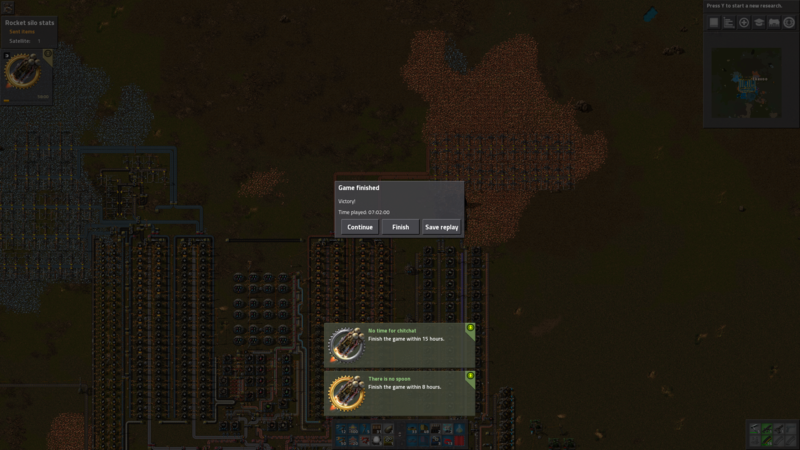 I have just got the 2 achievements left, There is no Spoon and No Time for Chit Chat. I will say, it amazes me, that by looking at both of the pics of seeds here, that you only need 2 yellow belts of iron and copper to complete this, is that right? I haven't done the math, but one would think that this is not nearly enough production to take care of everything you need to do within 8 hours. Also, how compact everything is is surprising. I won't be able to plan this way lol, but I should be able to borrow some of this info to complete these 2 achievements. Nice Raneo. There are lots of "look how I did Spoon" posts but very few take the time to post the map, screenshots and especially the blueprints. As DOSboots said, adding a write-up with step by step instructions would also help. I am one of those "slow and steady" builders who usually does a lot of trial and error, rebuilding the same section several times until happy with it, and totally not a twitchy fast builder. After trying g a couple times and failing at the much easier "On track like a pro" I had given up on all of the speed achievements and was planning on doing them in multiplayer someday. But with the stuff you posted I might even give it a try. I got both of these in a weekend couple of weeks ago. Was just messing around in vanilla and realized that on the railworld base I was making that at about 9 hours in, that I could actually get the No time for Chit Chat, Made it with like 10 minutes to spare. Then I went through the base and starting making blueprints of the areas I needed and started figuring out what technologies I could cut out. Cutting out research for trains, all but the required military, and I lot of other stuff cut my research time down by like 3 or 4 hours. Other big thing that got me in the first run was fighting the stupid biters. They were out pretty far and didn't respawn but they still were a pain in the neck. They actually completely destroyed one of my outposts while I was creating blueprints. But the devs modified the achievement so you can't turn bases to none anymore and get the achievement. So it was turning richness/frequency to very low and starting area to very large. I think I also turned off evolution and maybe pollution but can't remember. I think the 2 biggest things that helped me were investigating the map before I started. I rerolled a few times till I got the ore patches in good areas and not a huge amount of trees. And actually laying out where things in a practice run was crucial since I wasn't placing a full base blueprint. Second thing was I didn't spend time building things that I was just going to tear down. So the first furnaces were placed in their final position on the specific blueprint and same with the labs and the red/green science. That was a huge change for me. One other thing was that once gold science was complete, I re purposed all of the speed modules to feed into the rocket parts. So, I decided to give this one a try. I used Raneo's blueprint and map seed and successfully finished in 7:15!! The blueprint needs some work (more labels) but, for the most part I was able to get it between looking at the image he posted and the blueprint. So glad to have this one checked off! At about two hours left, I started sweating a bit because I didn't even have all the research completed. 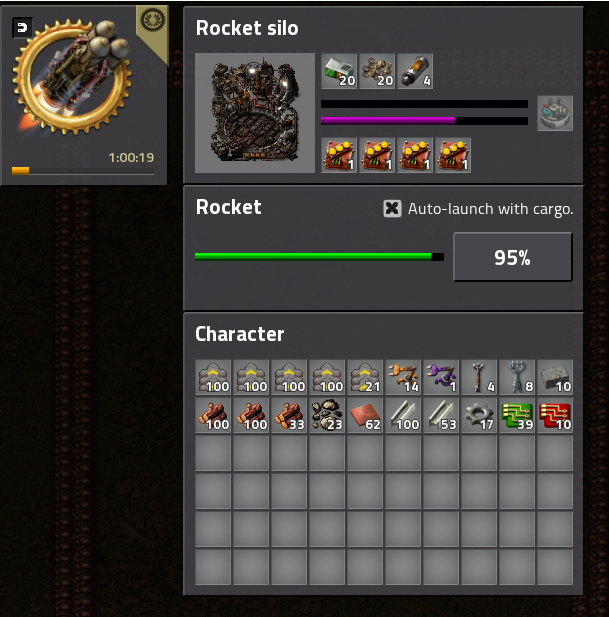 But once I got rocket silo, I had already buffered a bunch of raw material and the rocket building/satellite went very quickly! 8:07... so close and yet so far. I agree with Chooko, the map/blueprint need a few improvements. Labels to indicate the order of construction would be a minimum. --- Red circuits (the main constraint here), and its supporting green circuits, iron and copper plate smelters. --- 1 more refinery, plastic chem plant. - Might need storage tanks for fluids, the refinery stalled without them (although it might have been due to human error placing pipes). --- Iron and Copper plate, pipe, engine, electric engine, red circuits, blue circuits (you need 300 for rocket silo and satellite). - Maybe an early tiny "mall" to make underground belts, splitters, blue assemblers, electric mining drills, pipe and underground pipe might speed up construction. - Mark location of burner drills in the blueprint... would be handy for those trying it for the 1st time. - Burner miner to tier 1 assembler to make furnaces early. - Maybe automate production of Productivity Modules 1-3. You need productivity modules on your science and rocket silo. Not sure if it will be needed on blue circuits after expanding red circuit production. - Once you start rocket production you can stop blue, purple and yellow science from siphoning precious resources by setting their buffer chests to zero. That stops the belt and the assemblers once it clogs up. Or if you are panicking... just take out the inserters. - Don't forget to collect supplies for the rocket silo and satellite in advance. On the other hand this is quite good and got me much closer than anything else I tried before. At least it gave me "No time for Chitchat". I just registered to say thank you for the 16.x Guide; Did it in 6:58, had 2 Phases where I thought i wont make it, but after adapting some lanes from the original Blueprint to fix some bottlenecks on my side it worked out fine. Bottlenecks were basically Grey/Pink/Yellow Research, Motors and Lighweight Components. I want to say it worked for me as well. I only saw Raneo's post (I got here through the forum search) and I can honestly say that if I had seen D0SBoots' full writeup at the beginning it'd have helped me a lot. At the 4 hour mark I had everything but modules and rocket speed, but that last stretch takes foreeeever. And I stopped halfway through to research Logistics 2 because there were a lot of throughput problems. I also eventually decided to upgrade the Blue Chips area to AM3 because were they struggling to keep the pace, both for Yellow Science and for the Control Units. The other bottleneck was refining oil and making fuel. I added two refineries and quadrupled the fuel chem plants for good measure. The problem was likely the fact that I buffered fuel in wooden chests instead of steel chests. Then... I realized the chest that held my sattelite held other crap. Ugh... thank you, autosave at the 7 hour mark!